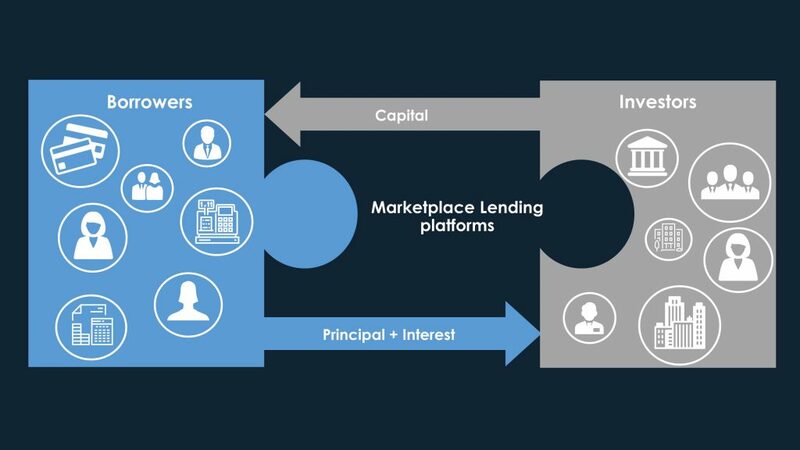 Marketplace lending is a concept whereby borrowers and investors (or lenders) are matched via online platforms to originate credit transactions, resulting in the disintermediation of more traditional financial institutions. The business model, which originated in 2005 and is driven by financial technology, has begun to take market share from the traditional lending operations of the large commercial banks. In the traditional bank-lending model, a decision to extend credit to an individual or a business is not a binary decision made solely on the creditworthiness of the counterparty. Banks typically make decisions to extend credit based on a variety of exogenous factors (cost structure, capital regulatory pricing, relationship, etc. ), which often results in a lack of credit risk-based pricing for the borrower. Through the emergence of e-commerce and big data processing, the online marketplace lending model has developed efficient and compelling ways to analyze and categorize credit risk on a more granular fashion across borrowers. Focusing on high quality credit via a transparent and risk-based process, lending marketplaces allow borrowers to obtain loans with interest rates that are often lower than those offered by commercial banks or credit card providers. These platforms enable lenders to acquire loans with interest rates and credit characteristics that can offer attractive net returns (after fees and defaults). As a result, investors and borrowers on these lending marketplaces commonly share the margin that a traditional banking intermediary would normally capture. The Platforms often charge fees to their lenders for the services provided, including screening borrowers for their eligibility and credit criteria, managing the supply and demand of the marketplace, and facilitating payments and debt collection (the “servicing”). The added value brought by these marketplaces to both borrowers and lenders is behind the strong volume growth, although Marketplace Lending remains a relatively small part of the $3.3 trillion U.S. consumer lending market. Platforms typically use multi-level credit and risk rating models to assess the creditworthiness of borrowers. Consumer platforms focus on high quality borrowers, categorized as ‘prime’ to ‘super-prime’ by historical FICO®-based or similar standards (the FICO® score is a US personal rating computed by the Credit Bureaus nation-wide). Certain Platforms provide upwards of 100 “anonymized” data fields on each borrower which allow lenders to make educated decisions in their loan selection process. Borrowers are required to submit detailed information about themselves, their employment status, their general finances and the purpose of the loan. Their applications are subject to detailed review and credit scoring by the Platforms. Many applications are automatically declined as a result of failing on one or more basic criteria, such as insufficient credit scores, or debt-to-income ratios that are too high. The marketplaces also obtain information and a credit assessment rating from one or more independent data vendors. Applications are then further reviewed through their underwriting process, which includes both identification and fraud checks. In the case of consumer loans, most employed borrowers and/or their employers are contacted individually in order to verify the information provided (monthly salary for example). After accepting a loan application, classifying each loan into a credit grade and assigning an interest rate level or band, the Platform posts the loan request online for funding on an individual or pooled basis, depending on the marketplace. As whole loans, where the investor can pick and choose each loan and acquire it in full ownership, in a ring-fenced manner. This is the market that Smart Lenders AM uses because of the ability to choose and the segregation of the assets away from the platforms’ balance sheet. As fractional loans, where loans are divided into smaller denomination in the form of a certificate, or a share of a loan. As an investment into a passive trust, a kind of fund replicating the performance of the overall production of the platforms. This is a passive way of investing, relying on the selection of the platforms. As a result, investors have the transparency through certain marketplaces to acquire loans based on their desired borrower criteria and risk appetite. Once a borrower receives funding and accepts a loan offer, the amortizing loan is activated and principal and interest are paid down on a monthly basis for the specified loan term. Investors earn the stated interest net of any marketplace servicing fees and less any defaulted repayments. Marketplace lending is not a new investment; it is a new access to a proven asset class called “prime consumer credit” and, while Lending Club and Prosper – the two US-based pioneer platforms – have a relatively recent dataset between them, consumer credit has decades of open data, specifically the money that major banks have made off credit cards. Credit cards are a similar investment to a marketplace consumer loan. Both are simply a line of credit given to creditworthy individual Americans. Both are part of the ‘consumer credit’ asset class and, if we examine the historical performance of credit cards, we get a picture for how marketplace lending may perform in the coming years.